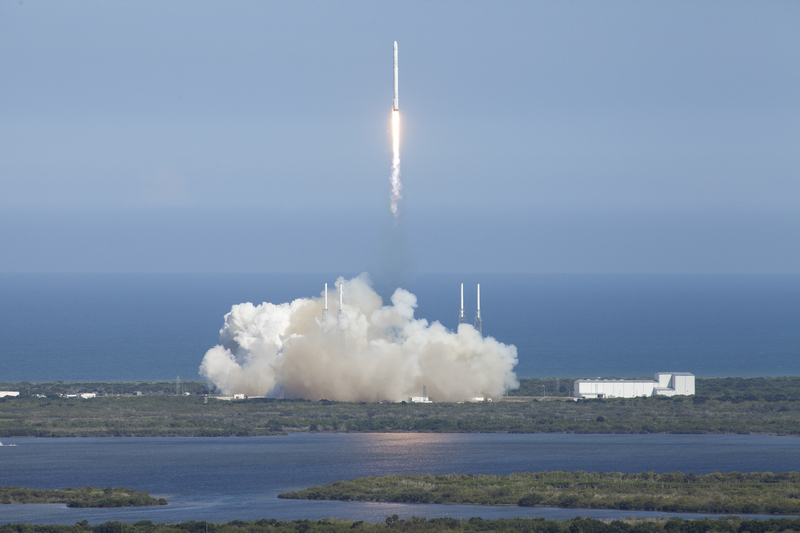 April 15, 2015 – On Tuesday, April 14, 2015, SpaceX’s Falcon 9 rocket and Dragon spacecraft lifted off from Launch Complex 40 at Cape Canaveral Air Force Station in Florida, beginning SpaceX’s sixth official mission to resupply the space station for NASA. The launch occurred at 2:10pm MDT. Falcon 9 was carrying the Dragon spacecraft, which is loaded with about 4,300 pounds of supplies and payloads bound for the International Space Station (ISS). Approximately three minutes into flight, Falcon 9’s second stage and Dragon separated from the rocket’s first stage. The second stage’s single Merlin Vacuum engine ignited for a seven-minute burn to deliver Dragon to its initial orbit. Dragon separated from Falcon 9 approximately 10 minutes into flight, and began deploying its solar arrays shortly thereafter. Below the solar array fairings can be seen separating from the spacecraft. Dragon is now on a two-and-a-half day journey to reach the ISS. It is targeted to be grappled by the station’s robotic arm on Friday, April 17 at approximately 5:00am MDT, with berthing and hatch opening occurring over the following day. Research that will help prepare NASA astronauts and robotic explorers for future missions to Mars is among the two tons of cargo on its way to the International Space Station aboard Dragon. Dragon’s cargo will support approximately 40 of the more than 250 science and research investigations that will be performed during Expeditions 43 and 44, including numerous human research investigations for NASA astronaut Scott Kelly’s one-year mission in space. Meanwhile, Falcon 9’s first stage attempted a precision landing on our autonomous spaceport drone ship named “Just Read the Instructions” as part of an ongoing attempt to land and recover a rocket after it completes its primary mission. The stage made it to the drone ship and landed, but excess lateral velocity caused it to tip over.